A school newsletter announced an Easter Bonnet Parade, which is completely new territory to a Mum with a child in the first year of school. Did we have Easter Bonnet Parade's in my primary school back in the 80's? Maybe we did, I can't remember. Anyway, what sort of hat would be appropriate for a boy to wear to an Easter Bonnet Parade? 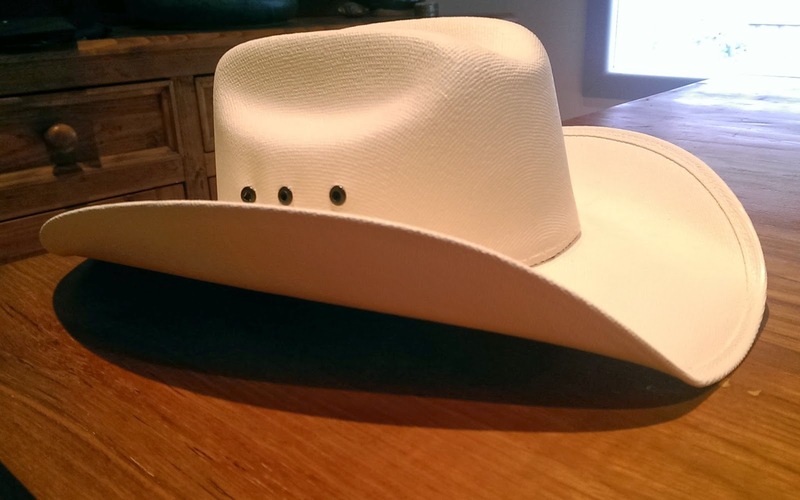 I found an Easter Bunny Cap via Kidspot when googling for ideas and then found just the right hat in Family Life Opportunity Shop last week for an Easter refashion; a kids white cowboy hat for $1.50. Junior Recycled and I sat down together to make some rabbit ears out of a cereal box, painted gold (his idea) and covered each ear rim with cotton wool. I got out the trusty old hot glue gun and went to work sticking our ears on either side, as well as a set of little yellow chicks to the rim. We have ourselves a Cowboy Easter Bonnet. In other news, Baby Recycled finally got to wear his freecycle comic fabric onesie, and thought it funny to blow raspberries while wearing it. Do you remember Easter Bonnet Parade's at your school? I've never heard of an Easter bonnet parade;I grew up here in California and we did have Halloween parades at school. The hat you made is so cute! will be keeping an eye out for next year lol! We had one every year at our school in the 80's but my kids haven't had one yet. I think I'd enjoy the challenge. He looks very pleased with his hat!